1 - Marsh Clean-Up This Saturday, 8:30 a.m. This is Earth Week. What better way to celebrate than to help clean up our little part of the earth, Dunn’s Marsh? Fitchburg will provide refreshments and a tote bag or T-shirt to participants. Volunteers are encouraged to wear boots and bring work gloves. Be forewarned: Restroom facilities are often not convenient to the planned cleanup locations. Fitchburg, Oak Bank, Pellitteri Waste Systems, and Surplus-IT have scheduled Fitchburg’s Spring 2012 Electronics Recycling Shred Day Event on Saturday, April 21. The Shred Day Event will be held 7:30am to 10:30am in Oak Bank’s parking lot at 5951 McKee Road. Look for Pellitteri’s Shred Truck in the parking lot. This event provides shredding to destroy your confidential paper documents. Up to 5 bankers boxes of confidential paper documents can be shredded and recycled FREE of cost. Please contact Jeff Potter (Pellitteri) at 257-6232 ext 323, jeffp@pellitteri.com or Felipe Avila, at 270-4277, felipe.avila@city.fitchburg.wi.us, with any questions about the shred event. The Electronics Recycling Event will be held from 7:30am to 11:30am at Surplus-IT’s warehouse (901 Watson Avenue). Look for directional signage from the intersection of Fish Hatchery Road and Greenway Cross heading to the east. Please contact Lee Shinefield (Surplus-IT) at 209-8000, lee@surplus-IT.com or Felipe Avila, 270-4277 or felipe.avila@city.fitchburg.wi.us, with any questions about the electronics recycling. available in the lobby of Fitchburg City Hall. Happy Earth & Arbor Days 2012! April is here and the birds and frogs are beginning to announce that “Spring is Here!” As you can see by the breadth of environmentally-related articles and events in this Update, it is going to be a busy next couple of months for all of us as we prepare for the warmer weather by spending more time outside. Starting in April, there are numerous activities you can participate in that will help continue Fitchburg’s commitment toward protecting our environment. Please read through all of these events and pledge along with me to participate in as many as you can. If you know of additional opportunities, please let me or my staff know and we can help get the word out. These events are a partnership of many residents, businesses, and city staff and will help us set the stage for demonstrating and continuing Fitchburg’s leadership in environmental sustainability. I’m a visual person. If you are too, this issue of the newsletter is for you. There are no less than FIVE photo collages to pore over. They aren’t just eye candy. They are meant to show you some of the activities that are taking place in the neighborhood. Here’s the list and the topics covered by each collage. “1 pic Little Libraries2.jpg” shows a couple of Little Free Libraries constructed by SIFE, Students in Free Enterprise, a UW student group. The DMNA has applied for a City of Madison grant that would bring up to 10 Little Free Libraries to the neighborhood as well as 2 message boards. The photo also shows some of the SIFE students and people from the neighborhood and from Prairie UU Society. Prairie UU will be putting up one of the Little Free Libraries. Photo is from March 25. 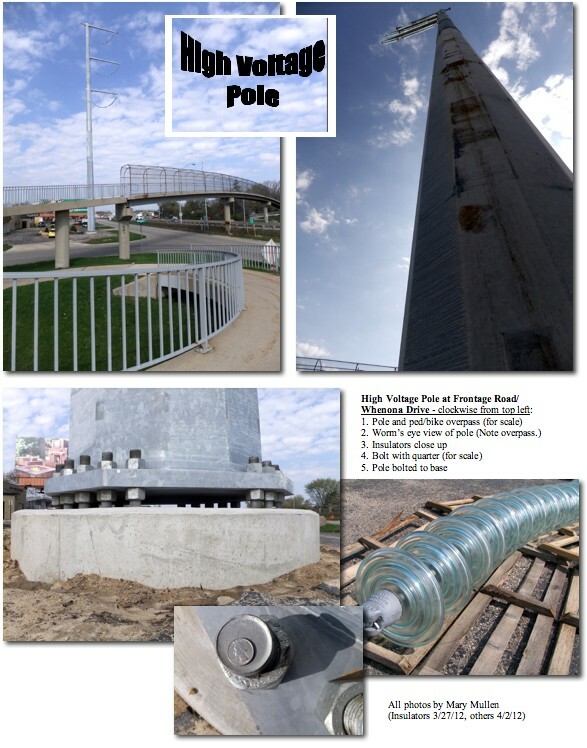 “2 pics ATC pole.jpg” gives close-up views of the huge metal pole that went up at Whenona Drive and the Beltline Frontage Road. See how big the bolts are, what the insulators look like close up, and how tall it is compared to the pedestrian overpass. 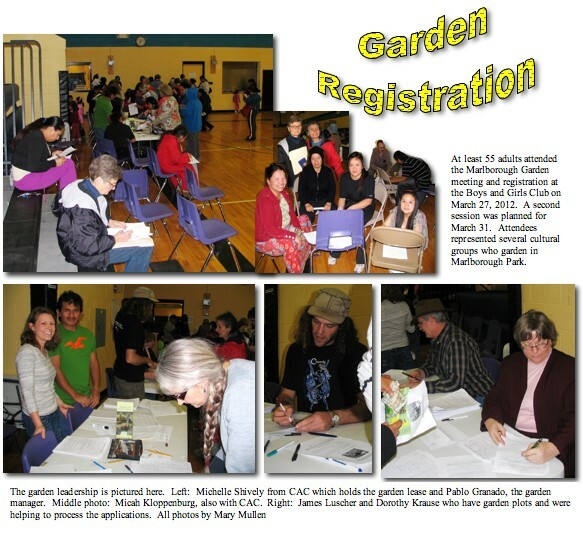 “3 pics garden regis.jpg” shows the big turnout of people who came to the Boys and Girls Club on March 27to sign up for garden plots in Marlborough Park. Gardeners are a multi-cultural bunch: Mostly Latinos, Asians, and Caucasians. 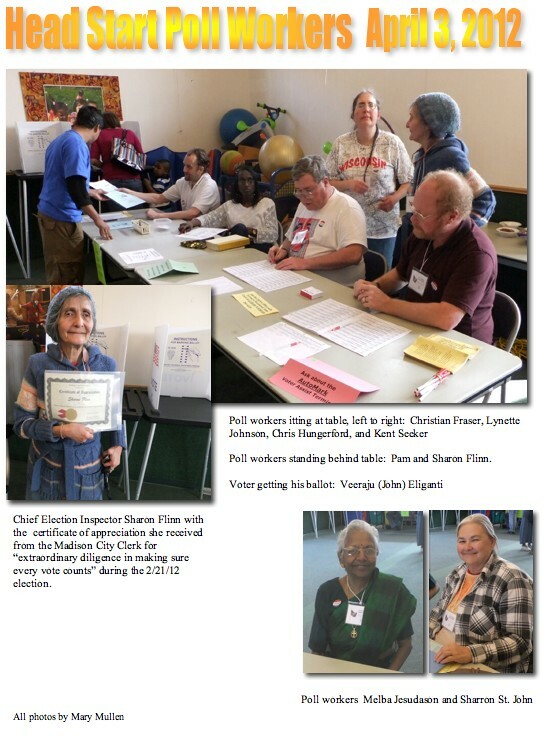 “4 pics polls 4-3-12.jpg” features the neighbors who worked at the polls during the April 3 election. Again, they are a very multicultural crew. SPECIAL NOTE: We have another election coming up Tuesday May 8. It’s the primary election related to the recall of Governor Walker and Lt. Governor Kleefisch. As usual, the polls will be open from 7 a.m. until 8 p.m. If you are not registered to vote, you can still register at the City Clerk’s office or you may register at the polling place. As of this writing, photo ID is not required, but keep your eye on the news. “5 pics neighb mtgs2.jpg” shows DMNA Council members at the February 8, 2012 meeting, the three presenters who spoke at the April 4 informational meeting sponsored by the Dunn’s Marsh Neighborhood Association, and two of the many neighborhood dog walkers and their dogs. The Neighborhood Liaison Officer from the MPD, a representative from the American Transmission Company, and the Fitchburg Environmental Engineer spoke at the April 4 meeting. About 25 people attended the meeting. This page contains contact info for district command staff, as well as current district news. You can receive specific MPD alerts (including the West District newsletter and West District Updates), as well as alerts related to other City services (like construction and snow plowing updates). You can also sign up for blogs from your elected officials. We try to assign a police officer to serve as a liaison to each neighborhood association in the district. The Dunn’s Marsh Neighborhood liaison officer is Brian Sheehy. 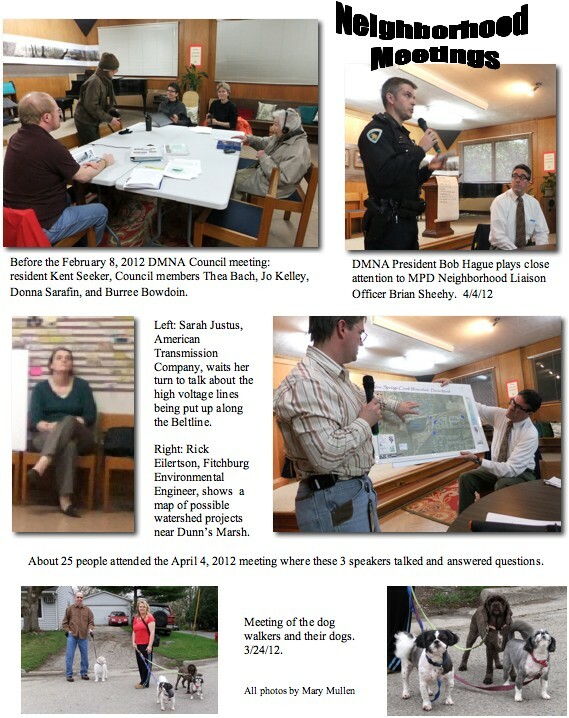 He spoke to neighbors at the April 4 Dunn’s Marsh Neighborhood Council Meeting. West District command staff are always available for questions, and I would be happy to try and stop by any association meetings or other events to say hello and answer any questions you might have. Feel free to contact me with any questions or concerns. Thank you. Most of us never expect our beloved pets to be lost or stolen. We hope that leashes, fences, and doors will be enough to keep them safe at home. The reality is that accidents do happen, and when they do, many owners are unprepared. Protect your pet with a microchip AND an ID tag. The combination of a microchip and an ID tag is the ideal way to reunite you and your pet if you get separated. It gives the best of both worlds by providing visual and implanted identification. Dane County Humane Society is pleased to offer microchipping and tagging services at the main shelter during all open hours. No appointment necessary. The ID tag provides immediate owner information. The microchip provides backup information if the ID tag is separated from the animal. Special rates April 15-21 only! Visit our main shelter (5132 Voges Road, Madison) during open hours (weekdays 3-7pm, weekends 12-5pm, closed Wednesday) to take advantage of this offer. Each year Dane County Humane Society (DCHS) receives approximately 3,000 dogs and cats brought to the shelter as strays. In 2011, the total was 1,109 dogs and 1,915 cats several of which came from this neighborhood. Most of us never expect our beloved pets to be lost or stolen and we hope that leashes, fences and doors will be enough to keep them safe at home. The reality is that accidents do happen, and when they do, many owners are unprepared. "Animal Service Officers report that the two biggest reasons dogs and cats become strays is because children and workmen inadvertently let them escape from the house or yard." Microchip is the best way to reunite lost pets with their owners because tags can get separated from the animal. The combination of a tag and microchip give the best of both worlds by providing a visual ID and an implanted ID. Have your veterinarian check your chip yearly to make sure it remains up to date and in place. No pet should be allowed outside its house without identification. Microchipping can be done on a walk-in basis whenever the shelter is open or by your veterinarian. There is a wealth of information on the DCHS website (giveshelter.org) where one can search to determine whether your lost pet may be there or to learn how to search for and find your pet. Just click on the “Owner Support” link. Sometimes circumstances arise that result in owners becoming unable to keep their pets. Some people release their pet into the wild or near a farm with the false belief that it will settle in and find a new home. Doing this is actually a very stressful experience and is an inhumane solution. If you need to find a new home for your animal, DCHS provides a free rehoming service via their website. Or, you may make an appointment to surrender your animal to DCHS for a small fee which goes to the care of the animal. And for those of you looking to add a new pet member to your home… “don’t shop – adopt!” at Dane County Humane Society 5132 Voges Road, Madison WI 53718. “1 pic Little Libraries.jpg” shows a couple of Little Free Libraries constructed by SIFE, Students in Free Enterprise, a UW student group. The DMNA has applied for a City of Madison grant that would bring up to 10 Little Free Libraries to the neighborhood as well as 2 message boards. 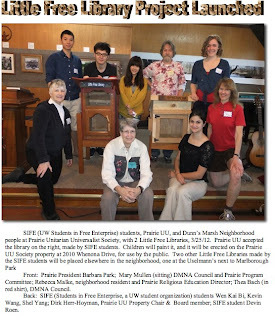 The photo also shows some of the SIFE students and people from the neighborhood and from Prairie UU Society. Prairie UU will be putting up one of the Little Free Libraries. Photo is from March 25. “5 pics neighb mtgs.jpg” shows DMNA Council members at the February 8, 2012 meeting, and a variety of neighbors and presenters who attended the April 4 informational meeting sponsored by the Dunn’s Marsh Neighborhood Association. 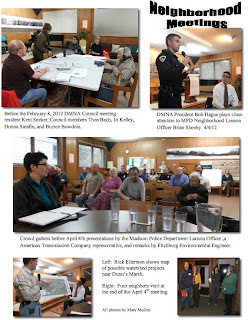 The Neighborhood Liaison Officer from the MPD, a representative from the American Transmission Company, and the Fitchburg Environmental Engineer spoke at the April 4 meeting, and about 25 people attended the meeting. From Sarah Justus, American Transmission Company. She notes that there will be overnight work to finish the work on the pole just west of the Seminole Highway overpass. This will mean a detour onto Lumley tonight. She also answers questions she didn’t have information on during last night’s neighborhood meeting. Thanks for the invitation to last night’s meeting. I have some follow up to several of the questions with one still outstanding. Please note in particular that the next overnight work in the area is happening tonight. Please do what you can to help share information with residents in the area, particularly on Lumley Road. I apologize for the short notice but in following up with the request I became aware of it this morning. Overnight Work – There is work scheduled overnight tonight (April 5) to finish off the pole just west of the Seminole Highway overpass. It will last one night. There is one more pole a bit further to the west that will require overnight work but it is on hold for now. I will follow up when that is scheduled. My apologies for the short notice. As I noted last night, we have no choice but to work within the hours that DOT will allow us to. When work requires the shutting of a ramp of frontage road they require that be done overnight to reduce impact to traffic and Madison Metro bus routes. The majority of our work is being done during daytime hours. Concern for shredded material remaining near Arboretum – I confirmed with our contractor, Asplundh Co, that the mulch and shredded branches that remain in the area that was cleared outside the Arboretum fence does not pose a fire hazard. Much like putting mulch around a newly planted tree, it will retain moisture and decompose quickly to help establish regrowth of native grasses. Question about wires near Day Care facility - I looked at the location of the facility and am assuming the question was in reference to the former St Vincent DePaul building at 4293 W Beltline Hwy. If that is the correct location, the wires cross over the frontage road in that area and are not over the building or parking lot. I will follow up in a separate email regarding the request for the decibel number for the discussion of corona, or audible noise. Thank you for your assistance in sharing information. If there are other outstanding questions I’ve forgotten, please let me know. Sarah Justus, American Transmission Company, will be present to talk about the high voltage lines that are being put up along the Beltline. Reports on the neighborhood sign and the grant for Little Free Libraries and neighborhood message boards. Any resident of the neighborhood may attend this meeting, but only Council members may vote. 2 - Tomorrow, April 3, is election day. Polls are open from 7 am until 8 pm. Picture ID is not needed this time, and if you aren’t yet registered, you may register at the polls if you have the proper documentation (Wisconsin license or ID number, SS number, proof of current residence for the past 28 days). Voters who live in the Madison part of the neighborhood cast their ballots at the Head Start Building, 2096 Red Arrow Trail, near McDonalds. Voters who live in the Fitchburg part of the neighborhood cast their ballots at Fitchburg Fire Station #2, 5415 King James Way, on the other side of Verona Road and just north of McKee Road (Co. Rd. PD). The ballot will include US Presidential candidates, judge, county supervisor, and school board candidates plus a referendum on worker rights. It’s been an honor representing you for the past 6 years. With the election on April 3rd, I will be redistricted to other neighborhoods in Madison and will no longer officially represent you. I am proud to continue on with the county board, and in that sense I will still represent you in forwarding our goals for smart public safety programs, strong human services, and preserving our natural resources. Always feel free to contact me or your new representative Kyle Richmond. With that, here’s my final update on what’s happening on the county board. Overtime Audit: I am currently serving on the selection committee for an outside audit of Dane County’s overtime costs, specifically in the Criminal Justice System. This audit is essential to letting us know how we can better serve our taxpayers by restructuring our operations or increasing base hiring to reduce our costly overtime hours. The audit should be completed by mid-summer, giving us time to implement any recommendations in the 2013 budget. Aging and Disability Resource Center: Dane County was awarded state and federal funds to create a new Aging and Disability Resource Center. It will be a one-stop shop providing services and information for individuals and their families / caregivers. The center will assist people, free of charge, in identifying their needs and determining what resources exist in Dane County to best serve them. The center should create almost 45 new jobs in Dane County. Plans are to open in the fall at a location to be determined. Wisconsin Farm Technology Days: The County will submit a formal proposal to host the 2015 Wisconsin Farm Technology Days. The three-day annual event is the largest agricultural show in Wisconsin and would bring in an estimated $1.8 million to the county. Dane County is the most productive agricultural county in the state, and farms comprise almost 70% of Dane County land. This will be a great opportunity for Dane County to showcase our farmers. State Law Changes Rental Rules: I authored a letter by the Dane County Board to the state legislature speaking against proposed tenant / landlord bill. The bill hurts low-income renters by allowing landlords to charge any amount for security deposit (compared to the 1 to 2 months’ rent limit under current law), granting landlords more reasons to keep the security deposit, and forcing courts to evict tenants for late rent payment even if the tenant catches up. Wisconsin doesn’t need more ways to keep people out of housing. Unfortunately, Gov. Scott Walker signed this horrible bill into law. Power2Give Dane Arts Donors: Dane Arts, a part of the Dane County Cultural Affairs Commission, is launching a new website to connect local artists with charitable donors. The site will include detailed descriptions of art programs, the costs, the amount of funding sought, how the funding will be used, and more. The goal is to help artists find financial supporters and grant donors more easily. Go to www.danearts.com. Foreclosure Prevention: The Dane County Foreclosure Prevention Taskforce is a coalition of housing non-profits, government agencies, and service providers that offers free legal assistance to Dane County homeowners facing foreclosure. The current numbers are bad—while the economy may be stabilizing, the number of Dane County foreclosures is going up. If you think you may need help with your mortgage, the sooner in the process you get help, the greater chance you have to change it. For more information, go to daneforeclosurehelp.org/. Voter ID & Recall Elections: The Voter ID law in not in effect—for now. Two Dane County Circuit Court Judges ruled the law unconstitutional. The State Supreme Court has taken it up and is expected to rule soon. Stay tuned! Meanwhile, the recall is a go: May 8th is the governor primary, and June 5th is the governor general election. Thanks again for all your support! Contact me with any thoughts, by email at bayrd@co.dane.wi.us or by cell at 658-7333.